My sister's here! She's in Dallas for 3 weeks on a clinical rotation for grad school. I couldn't be more excited - we already had the best weekend ever and have 3 more to go. Here she is, the cute one in the back. Needless to say, I am really happy I get to feed an extra mouth in the coming weeks. I am going to send her back to Wisconsin very fat and happy. So, first Sunday dinner together: Shepherd's Pie. I've always turned my nose up at Shepherd's Pie, and I'm sure you have too. It turns out, that's only because I didn't really know what it was. Do you know???!!! It's basically a beef pie with a mashed potato topping. Beef + gravy + mashed potatoes. Why, why oh why did I not figure this out sooner?? I think traditional Shepherd's Pie is made with ground lamb, and traditional American Shepherd's Pie is made with ground beef. I didn't really like either of those options, so I used steak instead. Then I added lots of vegetables (peas! corn! ), and kept the sauce to a very simple beef broth/gravy. So delicious, so easy, and so huge. I think we only finished about a quarter of the above photo. Start by preparing the mashed potatoes - boil potatoes in large pot of salted water for about 20 minutes or so, until fork tender. Drain the water, and place the pot over low heat until potatoes have dried out a bit. Mash them, then mix in the butter, sour cream, stock, and milk (or use whatever your favorite M.P. ingredients are). S&P to taste. Set aside. Meanwhile, preheat the oven to 400 degrees. Heat the olive oil and butter over medium heat, then add the onions and carrots. Cook until the onions are translucent, about 10 minutes. Stir in the mushrooms and cook a few minutes more. Transfer the vegetables to a bowl. Add the cubed steak to the same pan, sprinkle with plenty of salt and pepper, and brown on all sides until meat is cooked through. oh boy...and top with the mashed potatoes. Texturize the potatoes with a fork to allow for plenty of browning on top. 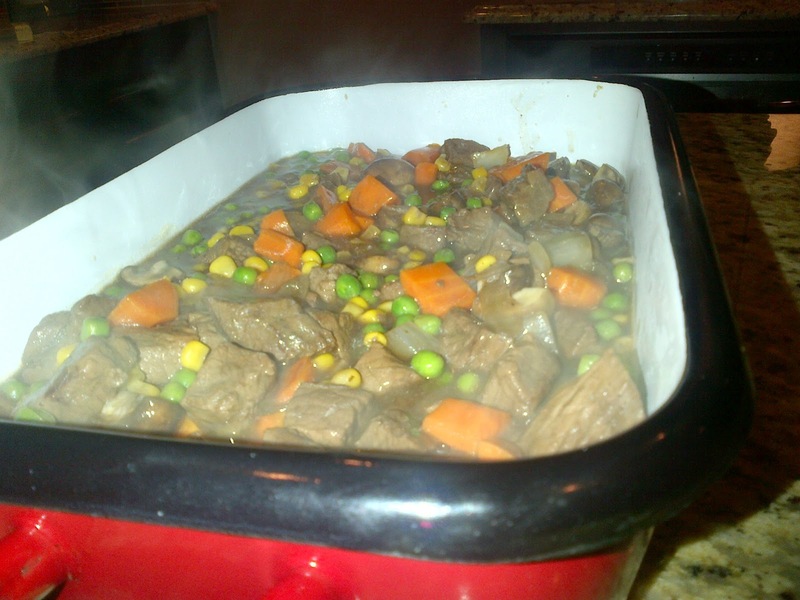 Place the pan in the oven for 15 minutes, then turn the broiler on for another 5. Let sit for several minutes before serving.